The Tahoe wasn't designed solely as a beach bag, but if a beach bag is what you're looking for, this one won't disappoint! Measuring 23in (L) x 8.25in (W) x 17in (H), this extra large tote has almost 1 cubic feet of interior storage space, enough to hold 48 12-oz. cans! 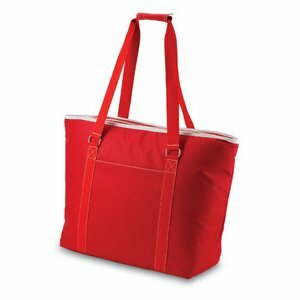 Fully-insulated to keep your food and drinks cold, the Tahoe also has a heat-sealed, water-resistant interior liner which is perfect for transporting wet pool towels, swim suits or the like. A larger zipper pocket on the exterior of the tote lets you keep other personal effects within easy reach. The Tahoe may be just the family-sized beach style tote you've been wishing you had.